Happy Tuesday, kiddos! Hope you are having a good week. This is the last full week of Hunger Action Month, which means this is the final food pantry-friendly recipe that I am sharing with all of you ( 😦 ) . 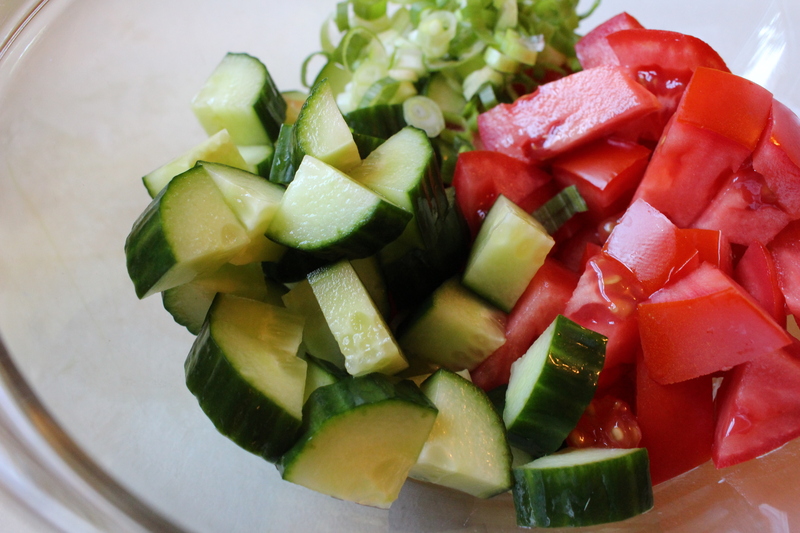 While you can alter ingredients in the two soup recipes I shared earlier this month, this salad is truly versatile. It can be served as a hearty side to grilled meats or can be transformed into a complete meal when it is spooned over rice. Versatility is always a good thing (and makes leftovers seem a bit more imagined!). What makes this salad so great is that it is a true open-dump-mix kind of recipe. Crack open the cans, dump them into a bowl, and you’re ready to eat. A quick meal that can be on the table in ten minutes but is still packed with good nutrition (music to this RD’s ears). This Fiesta Corn Salad begins with beans. I chose to use a combination of black beans and dark red kidney beans, but if you like a particular bean better, it’s totally cool to use that (pinto beans, anyone?). Just make sure that you drain the beans and rinse them very well to remove the salty packing liquid. Then you need to dump in some corn kernels. Again, make sure they are drained and rinsed well – studies have shown that draining and rinsing canned vegetables and beans reduces the amount of sodium they contain (!). So not only are you removing the gloopy “sauce” the veggies are canned with, you are also removing some of the sodium! Because who needs extra sodium in their diets (no one!). The final canned good in this recipe is canned diced tomatoes with chilies. I cracked open a can and poured it over the corn and beans – this time I did not drain the liquid off… this helps create the “sauce” for the bean salad. Look at those big chunks of chilies! The basic canned chopped tomato with chilies is fairly mild but you can always buy a brand labeled “hot” if you want your salad to have a little bit of a kick. All that’s left is to squeeze over some fresh lime juice. 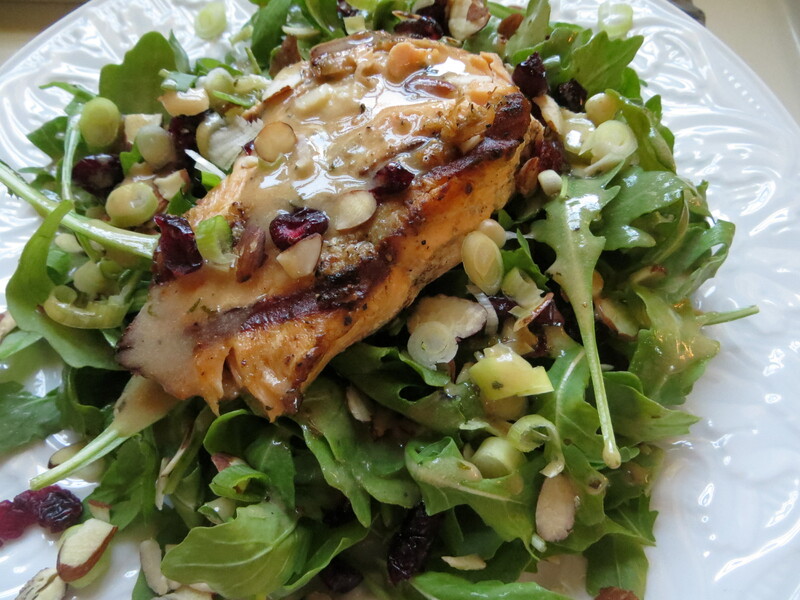 It adds some acidity to the salad that makes all the flavors brighten. Then it’s time to serve it up and dig in! 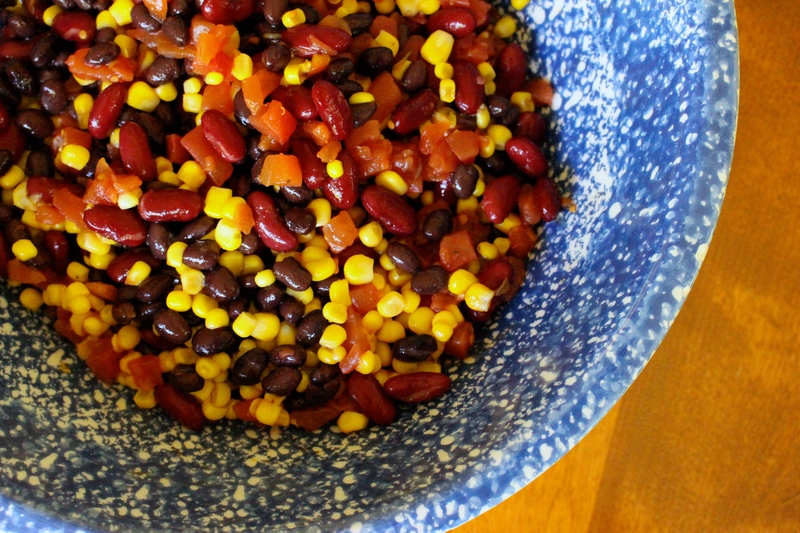 In a large bowl, combine the corn, beans, and tomatoes (juice and all!). Squeeze the juice of the lime over the salad. Stir gently to combine. Happy Friday, everyone! I hope everyone is having a good week. My week has been crazy, tiring, and enlightening all at once. The ICU has been an eye-opening learning experience and I have seen and done so much! But after two weeks of go, go, go, my brain said no, no, no to any more work last night. So I decided that a little dinner in front of the TV would be the perfect break! I seem to be on a salad kick lately, so I decided that I was going to make the French classic with a simplified twist! I first had Salad Nicoise at the Rodin Museum in Paris, France. It was the perfect combination of oil-packed tuna fish, crisp haricot vert (French green beans), olives, and hard-boiled egg. It was the perfect combination of flavors and textures and it has become one of my favorite go-to salads on busy nights. My spin on a salad nicoise starts with a base of arugula. I know the traditional salad is only green beans as the base, but I like the fresh, peppery bite that the arugula gives to the salad. But that doesn’t mean that I totally ditched the green beans! My mom found frozen haricot vert at a local supermarket and I toss them frozen into a skillet and sauté them in a little olive oil until they are nice and crispy. Then I place the green beans on the arugula. A pretty burst of spring green on a cold winter night! 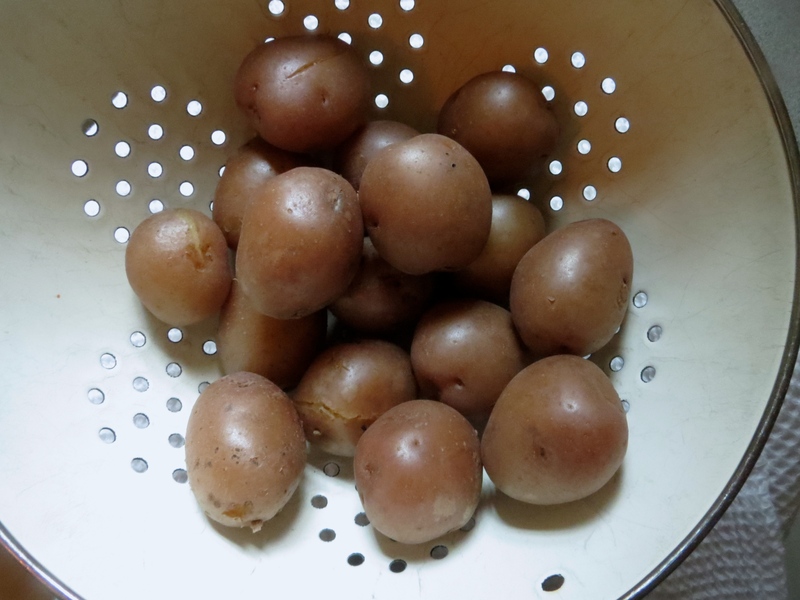 Which I follow with some diced up leftover potatoes. I layer the tuna fish next. It’s starting to look so pretty! I love pretty food, don’t you? The final row is the hard-boiled egg. 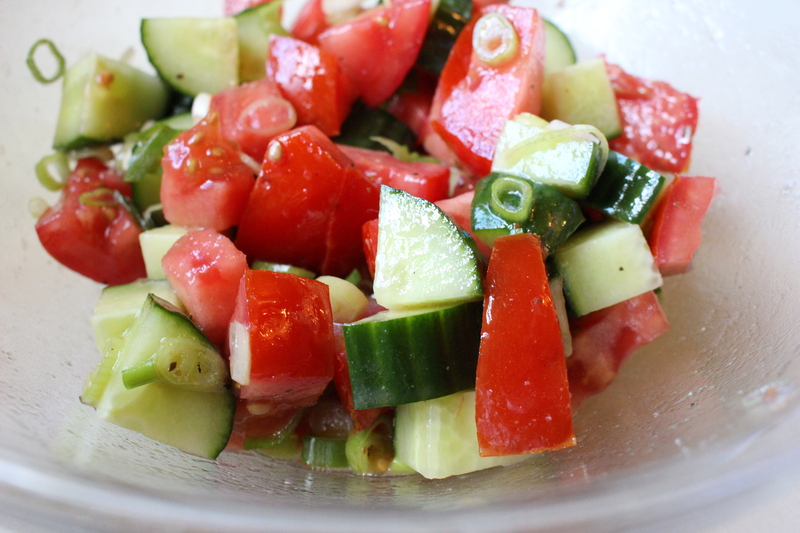 Sprinkled with a little extra salt, they are the perfect end to this salad. Did I mention that I love pretty food? The final touch is a drizzle of salad dressing. I am super particular about dressing this salad (salad dressing on the eggs… no thank you! ), so I use a spoon to drizzle it over the salad. But if you are not persnickety like me, go ahead and pour on salad dressing (it’s so much faster!). It is the perfect busy night supper (especially in front of a cheesy Christmas movie!). My second foray into using up the leftover grilled salmon was also a salad. But it was a special salad. It was a special salad because, in place of the lettuce, you use cubes of bread. A bread salad. Brought to you by an RD2Be. Every food fits, people! 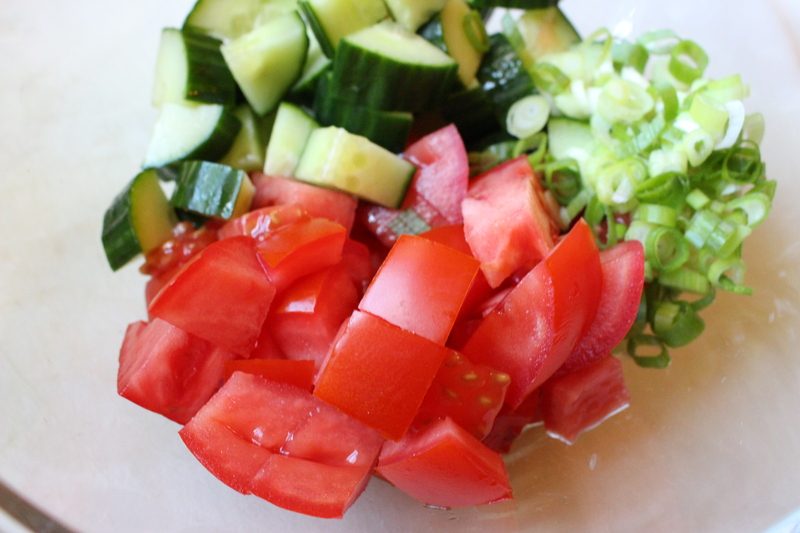 I first had this salad in Italy, where it is called panzanella (not bread salad). It is a salad of leftovers – stale bread, veggies that might be on their last legs, a bit of meat or cheese. Since I had been to the farmer’s market and bought all the fixins’ (unintentionally) for panzanella, I decided that it was the perfect way to finally finish the last of the leftover grilled salmon. And it all starts with stale bread… which I didn’t have. What I did have was some great whole wheat sourdough from the farmer’s market. I made it “stale” by popping it onto a medium-high grill for a few minutes per side. …before popping it onto the grill. Then it gets nice and golden brown and crispy. When it comes off the grill, it looks beautiful. And takes all your willpower to not eat it. Especially after you rub each side with a clove of garlic. This allows the bread to have the wonderful garlicky taste without the unpleasant sensation of biting into a huge chunk of raw garlic. Then cube the bread and let it sit while you get the toppings for the salad. Like these beautiful Juliet tomatoes (large grape tomatoes), thinly sliced red onion, and some arugula. Sweet, spicy, and pepper-y… the perfect accompaniment to the warm, crusty bread. Toss in the bread cubes. 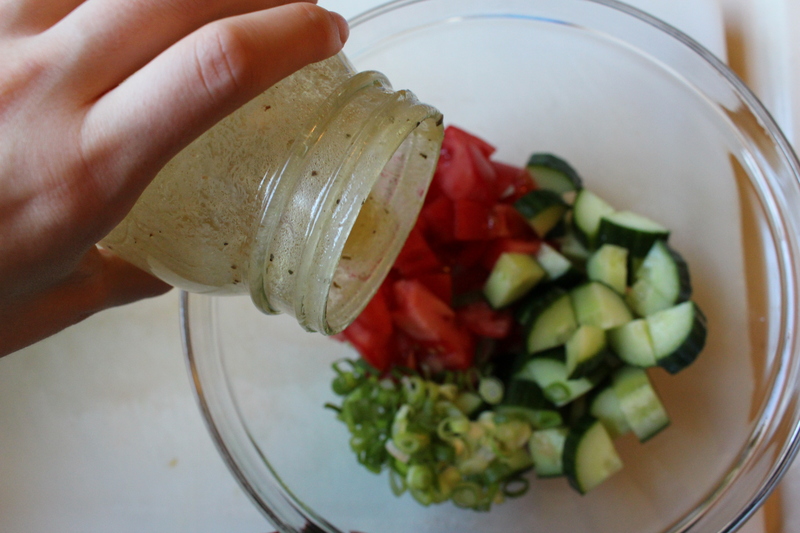 And add some of your favorite oil-and-vinegar-based dressing. I used the one that I talked about yesterday. Mix the salad well, making sure the bread has a chance to soak up all the dressing. I wanted to add a little freshness to the salad, so I added some sliced basil. All that’s left is to plate it up. Spoon some panzanella onto a plate and top with a piece of leftover salmon. 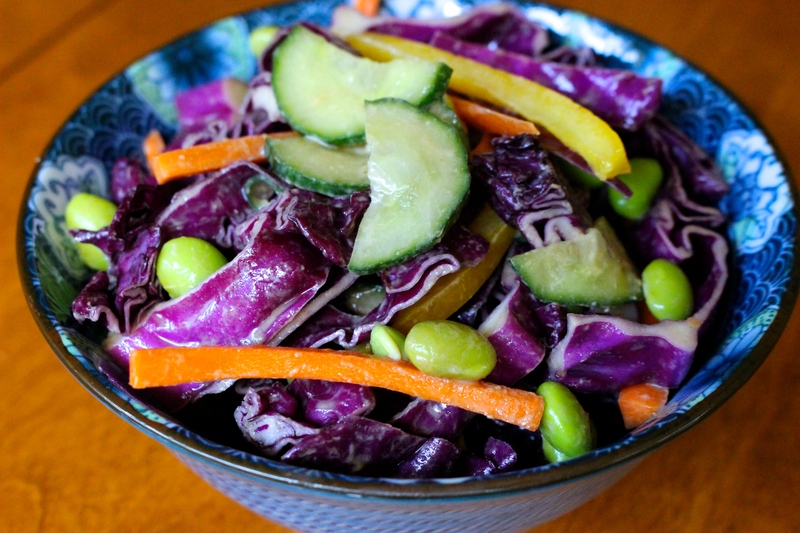 So colorful, delicious, nutritious, and a perfect way to use up leftovers. 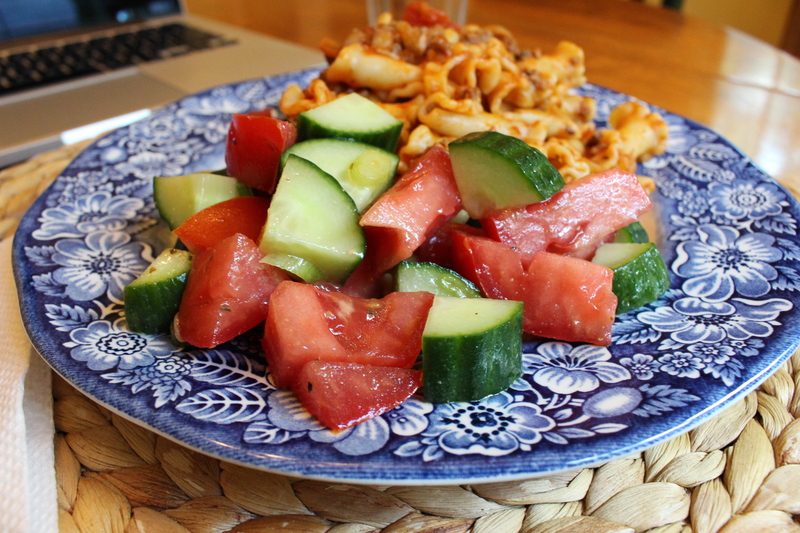 I hope you all enjoy this Italian dish that is a blast from my culinary travels past! So, kiddos, what’s your favorite way to use up leftovers? I would love to hear your ideas! Using a pastry brush, spread a thin layer of olive oil over both sides of each bread slice. Place the bread on the grill for 3-4 minutes per side or until golden brown. Remove from the grill and rub both sides of the bread slices with a garlic clove. Cut into large cubes and set aside. In a large bowl, combine tomatoes, onion, and arugula. Add in the bread cubes and half of the vinaigrette. 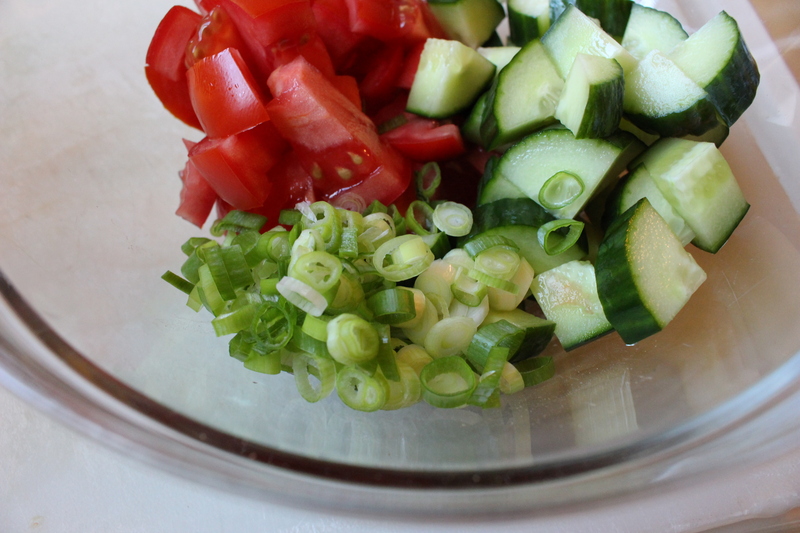 Toss together and gauge the moisture level – if it looks too dry, add more dressing. 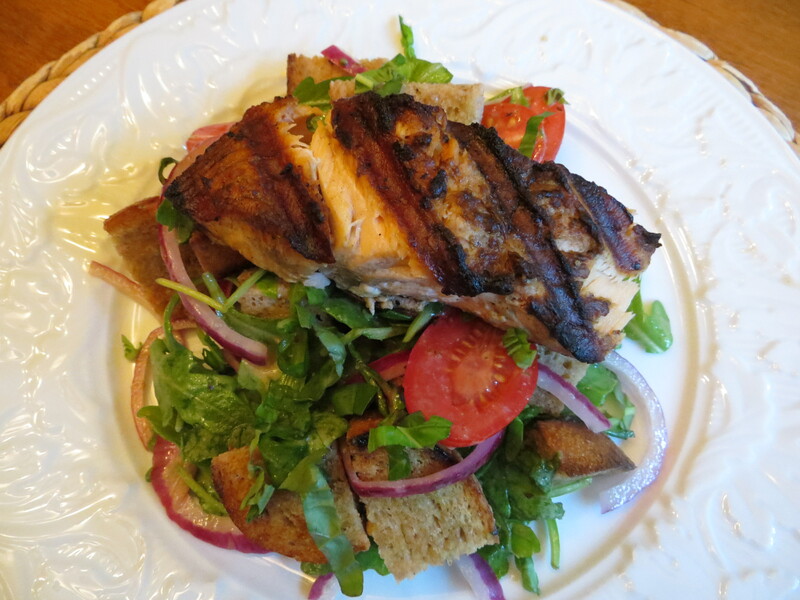 Place some of the panzanella salad on a plate and top with one of the leftover grilled salmon fillets. Serve immediately!